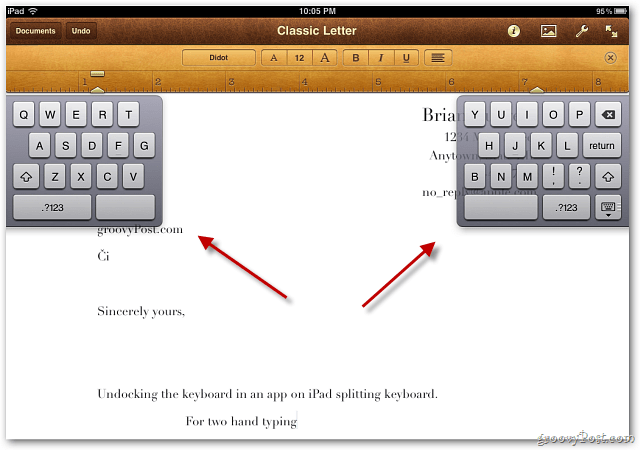 One little known new features in iOS 5 is the ability to move or split the keyboard on an iPad. Here a groovy tip on how it’s done. This works in any app that requires the keyboard. In this example I’m using the word processing app Pages. 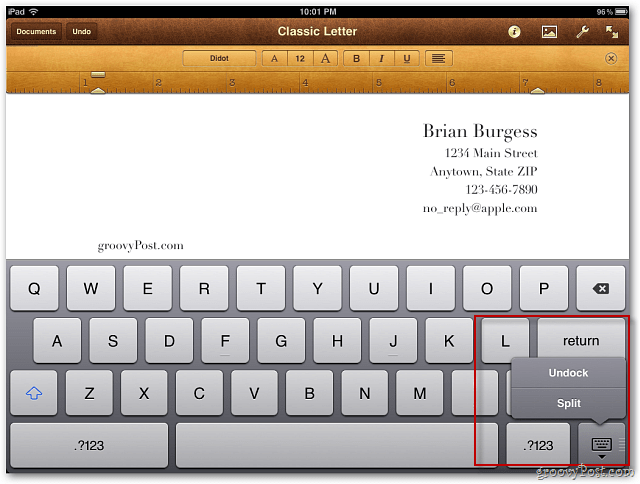 To move the full keyboard on the screen, press and hold the hide keyboard button until you see the options menu. Then select Undock. 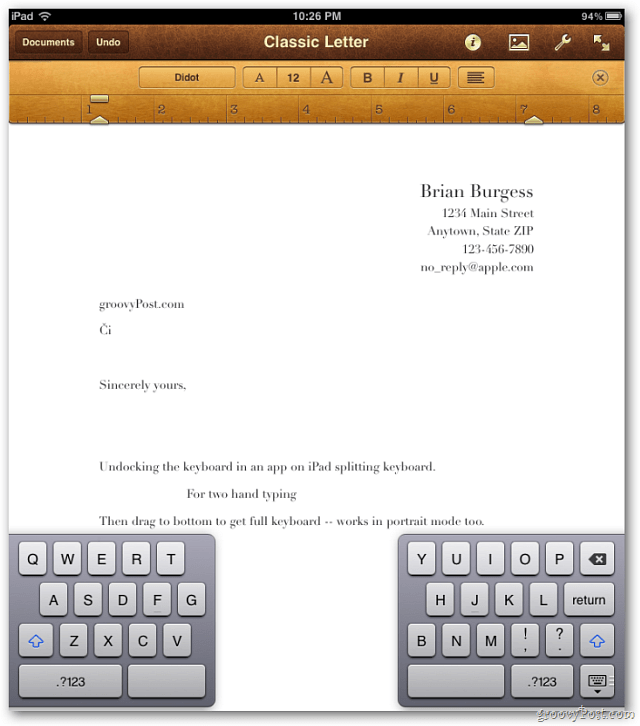 Now you can drag the full keyboard anywhere on the screen. The easiest way to split the keyboard is to use a finger gesture. On the keyboard, just move two fingers apart. When the keyboard is split, you can move it around on the screen too. Undocking or Splitting the keyboard also works in portrait mode. 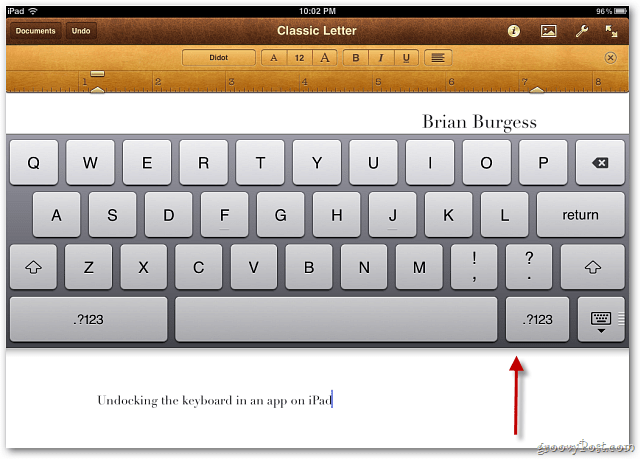 To get it back to the default location, drag the keyboard to the bottom of the screen. Groovy! @Alexander: Thanks! It’s a pretty cool feature huh? Thanks for the info on moving the keyboard, mine was “stuck” in the middle of the page for several days! I just learned where the Caps lock is: hold both shift keys. Thanks. My 3 year old had split the keyboard at the top of the page. Thank you so much for the very helpful information. I made a split keyboard last night, and proceeded to move my keyboard near the middle and was clueless as to what I’d done. Thanks again for the very clear directions on how to fix. Thank the Lord for Siri and you!!!!! When I click on the keyboard key, It says SPLIT or DOCK. I don’t get an UNDOCK. What now? 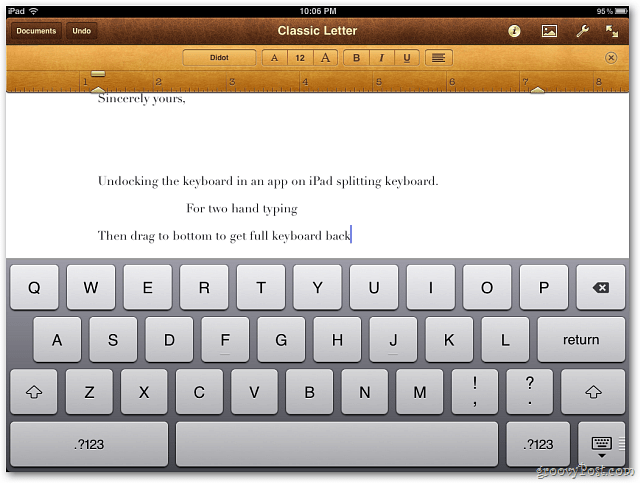 This is perfect…I apparently have a bad sector and it has blocked the letter k…by moving the keyboard it now works! !